The evil Lord Sauron has been slowly building his strength in the East, plotting his takeover of Middle Earth – a magical and bounteous land of Elves, Men, Dwarves, Hobbits and dozens of other creatures. The only missing piece to his malevolent puzzle is the One Ring, which he treacherously created in the depths of time, but subsequently lost in an ancient battle. Over the following millennia, he has been biding his time, striving to regain the lost ring and restore himself to indomitable power. Meanwhile, the ring has fallen into the hands of the light-hearted and naïve hobbit Bilbo Baggins and his nephew Frodo who, with the help of his gardener Sam, the wizard Gandalf and a fellowship of men, elves, hobbits and dwarves, sets out to destroy the ring, once and for all. Published in 1954 & 1955, J.R.R Tolkien’s The Lord of the Rings went on to become the second bestselling novel of all time and singlehandedly paved the way for sixty years of fantasy fiction. In order to support his exquisitely built story of good versus evil, Tolkien constructed an exhaustively complex backstory – including numerous full languages – that comprises as much material as actually appears in the already formidable main story line. Writing with a unique passion and beauty – frequently pausing for a lovely song or poem – Tolkien created a magical tone like the ancient Arthurian legends of old. Dozens of memorable characters come and go throughout the lengthy saga, from the sturdy Sam, and the affable yet frightening Gandalf, to the malevolently malformed Gollum and the beautiful and determined Eowyn – although ironically, the titular Lord Sauron never actually makes an appearance. While the author emphatically denied any allegorical intent, the books’ good versus evil storyline resonated strongly for decades following the horrors of the first half of the 20th century. With translations into 38 other (reality based) languages, the novel collected millions of zealous fans all over the world, spanning multiple generations. Having read the books numerous times, both years ago as a teenager and more recently as a 40-something adult, I’ve been repeatedly amazed by how the story holds up. There may never have been a book that more effectively allows the reader to fully escape the real world. I know that I’ve never read a book that so successfully pulled me into its world, exploring layer upon layer of the intricate storyline. Without a doubt, it’s my favorite work of fiction, so I was bound to view any theatrical adaptations with a skeptic’s eye. 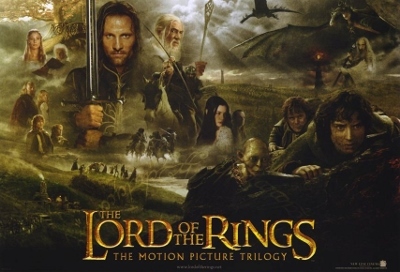 Hewing reasonably close to the main storyline – leaving out just a few side stories, while wisely adding some essential backstory – director Peter Jackson took over the country of New Zealand, spent eight years of his life and $281 million of other people’s money in his effort to do the epic trilogy cinematic justice, winning a Best Picture Oscar in the process. Released in three installments – from 2001 through 2003 – that roughly correspond to Tolkien’s three books, the movie succeeds for three discrete reasons. Fantastic casting of numerous key characters carries the movies a long way. Viggo Mortensen as Aragorn, Ian McKellan as Gandalf and Sean Astin as Sam the Gardener embody and expand their characters in ways that exceeded my dreams. While one might quibble about the performances of Hugo Weaving and even Elijah Wood, any shortcomings they brought to the screen were more than made up for by many others, particularly John Rhys-Davies, John Noble, Miranda Otto, Karl Urban, Christopher Lee and Cate Blanchett. One foul word evokes the single technical achievement – among many – that made these movies so amazing to watch: Gollum. The phenomenal fusion of groundbreaking CGI with Andy Serkis’ physical and vocal talents made for a character so memorable that many were pushing for an Oscar nomination for this remarkable cinematic chimera. Lastly, the beautiful musical and artistic work that permeates all three movies is literally otherworldly. Composer Howard Shore’s spectacular scores won him three Oscars and the three movies garnered a total of 30 Oscar nominations – winning 17 statues – in numerous artistic and technical categories. The exquisite attention to detail and unwavering passion delivered by hundreds of skilled artisans is evident throughout and helps the viewer achieve full fantasy immersion. Personally, I don’t think I’ve found a way to pick one over the other. Given that the trilogy is one of the most beloved novels of all time, any movie version was going to be hard pressed to measure up, at least in the eyes of true fans. But by making some shrewd casting and plotting decisions, gathering together an utterly devoted and talented crew and spending an incredible amount of time and money, Peter Jackson and company not only succeeded in presenting the story in amazing cinematic glory, they also fully conveyed the true spirit of the wonderful and treasured books. Despite having read and loved the books long before the movie was made, I was completely satisfied with Jackson’s production, although I can’t bring myself to say that the movies are actually better than the books. However, given the myriad challenges inherent in the task, I don’t see how Jackson could have done any better. I’m not sure that I would like the books as much if I had seen the movies first, but as a card carrying bibliophile, I still recommend a return to Tolkien’s original texts for any readers who have yet to do so. I’m confident that their timeless qualities will continue to fascinate future generations for many decades to come.